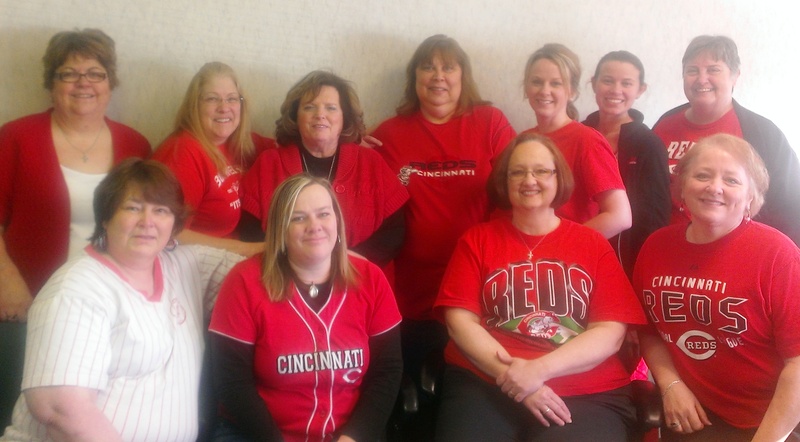 It’s “Opening Day” today for our Baseball Team the Cincinnati Reds!! So everyone around town and here in our office is proudly wearing Red or their Reds gear and I was trying to think up a recipe that I had that you could put together, forget about it and then watch the game. Add onion, garlic, carrots and potatoes to your slow cooker, sprinkle in the seasonings and give a stir, then add broth and beer. Cook on High for 4 hours or on Low for 6-8 hours. Meanwhile if you are using the cooked bratwursts then just slice into 1/2 inch pieces and saute them in a skillet to brown them on both sides. If you are using fresh you can do 1 or 2 things, cook them whole in the skillet browning them on all sides, or cut the casings off and pinch the meat into bite size pieces and cook them. Once the done then just put the Bratwurst into the soup and continue to cook. In the last 30 minutes of the cooking, remove 2 cups of the soup liquid a large saucepan over medium heat, sprinkle in the flour whisking the whole time, whisk in cream, then whisk in cheese adding a handful at a time until smooth. Stir cheese mixture into the soup stirring well to fully combine, cover and finish cooking. love bratwurst 🙂 Good luck to your team!